Michael Ferber is Professor of English and Humanities at the University of New Hampshire. His most recent book is A Dictionary of Literary Symbols, forthcoming from Cambridge University Press. 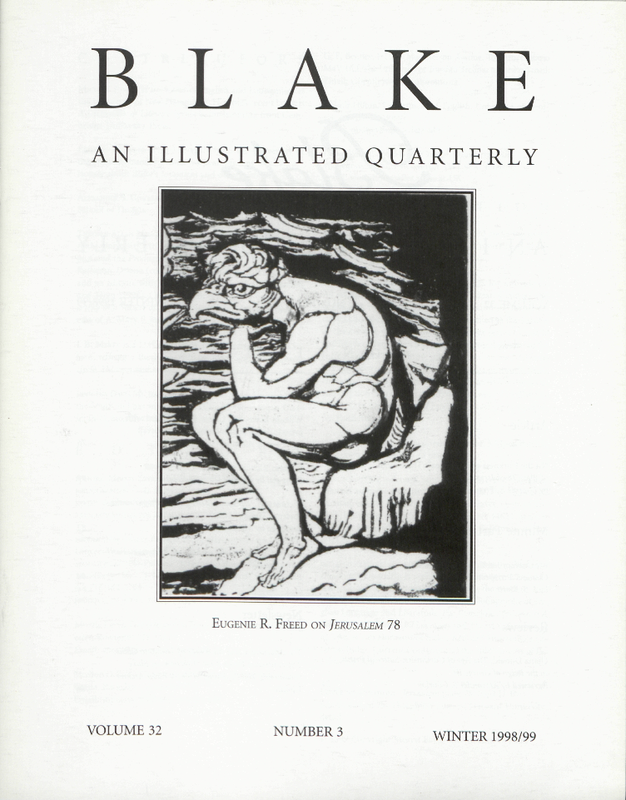 Eugenie R. Freed retired recently from the University of the Witwatersrand, Johannesburg, and is now thinking seriously about Blake’s Jerusalem and other matters. Terence Allan Hoagwood is Professor of English at Texas A&M University. His recent books include Politics, Philosophy, and the Production of Romantic Texts (1996), British Romantic Drama (coedited with Daniel P. Watkins, 1998), and an edition, with Cody Fife, of Emily Pfeiffer’s Sonnets and Songs (1998). Current projects include a book, Scholarship in a Society of Simulation, and an edition of the poems of A. Mary F. Robinson. J. B. Mertz is a D. Phil. student at University College, Oxford, writing a thesis on William Blake and the Johnson circle. He lives and works in Washington, D.C.
Jennifer Davis Michael teaches English at the University of the South and has an article on Blake forthcoming in Studies in Eighteenth-Century Culture. Cover illustration: Jerusalem plate 78, copy D. By permission of the Houghton Library, Harvard University, detail.